American tenor Bryan Hymel makes his debut at the Opera Company of Philadelphia this month, singing the role of the love-struck poet Rodolfo in Puccini’s iconic romance La bohème. French soprano Norah Amsellem sings Rodolfo’s beloved Mimì in an ensemble that includes American baritone Troy Cook as Marcello and American soprano Leah Partridge as Musetta. Opera Company of Philadelphia Music Director Corrado Rovaris conducts the singers in the house’s first production of the 2012-2013 season. Performances take place September 28, 30 and October 3, 5, and 7. Learn more & purchase tickets here. 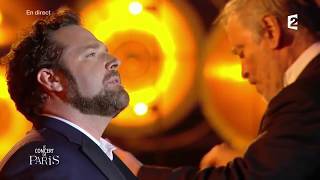 American tenor Bryan Hymel joins the Philadelphia Orchestra and its Music Director Designate Yannick Nézet-Séguin for an evening of Italian Opera at the Saratoga Performing Arts Center. The evening includes signature arias and duets from La bohème, La traviata, and Lucia di Lammermoor, among others. Bryan shares the stage with soprano Angela Meade, who, like Bryan, is also a winner of the Metropolitan Opera’s National Council Auditions.